NEW YORK CITY, N.Y., March 15 (SEND2PRESS NEWSWIRE) — EASEUS Todo Backup, the award-winning backup and disaster recovery solution for the Windows environment, features hard drive and partition clone capabilities to simplify the process of upgrading a hard disk or transferring files to a new hard disk drive for Windows Server 2000/2003/2008 and Windows 2000/XP/Vista/7. EASEUS Todo Backup can clone Windows Operating System hard drives and other non-system disks exactly in order to upgrade the hard disk to a new and larger one, saving your time and troubles to reinstall Windows and all applications. It’s comfortable to use with a sleek interface that guides you through the whole process of cloning a hard drive step-by-step. With the most popular file systems, FAT and NTFS, supported, this clone software can duplicate any hard drive under Windows. Moreover, to clone a Linux Ext2 and Ext3 partition will be an easy task via sector by sector clone. EASEUS Todo Backup helps clone a hard drive to any other hard drives, even with different interface, like from SATA to SCSI. For better disk management, it allows you to resize the hard disk partition during cloning. Meanwhile, to clone or restore an operating system to dissimilar hardware, Universal Restore built-in to EASEUS Todo Backup is included. As for cloning Server hard drives, this Windows Server cloning software is highly recommended; it will clone the entire hard drive for disk upgrading, saving a lot of time to deploy a new hard disk on Windows Server. EASEUS Todo Backup Home, free for home users, is available at: http://www.todo-backup.com/products/home/free-backup-software.htm . EASEUS Todo Backup Workstation for $39.00 is available online at: http://www.todo-backup.com/business/workstation-backup.htm . 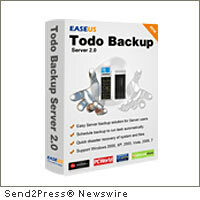 EASEUS Todo Backup Server, at 35 percent off special offer, now for $129.35 (normally $199) is available at: http://www.todo-backup.com/business/server-backup.htm . Original Keywords: disk cloning software, Windows 7, CHENGDU YIWO Tech Development Co, backup and disaster recovery solution for the Windows environment, EASEUS Todo Backup, partition, upgrading a hard disk or transferring files to a new hard disk drive for Windows Server EASEUS Software New York City New York NEW YORK CITY, N.Y.
REFERENCES: China Business News, disk cloning software, Windows 7, CHENGDU YIWO Tech Development Co, backup and disaster recovery solution for the Windows environment, EASEUS Todo Backup, partition, upgrading a hard disk or transferring files to a new hard disk drive for Windows Server EASEUS Software New York City New York NEW YORK CITY, N.Y.